Clams, snails, and squids, oh my! Gonzalo Giribet, professor of Organismic and Evolutionary Biology and curator of invertebrates in the Museum of Comparative Zoology, has collected mollusks and their shells around the world and is working to construct a mollusk family tree. Giribet, who curated a new mollusk exhibit at the Harvard Museum of Natural History, said mollusks are easier to study than soft-bodied invertebrates because even after a mollusk dies, it leaves a shell behind for examination. 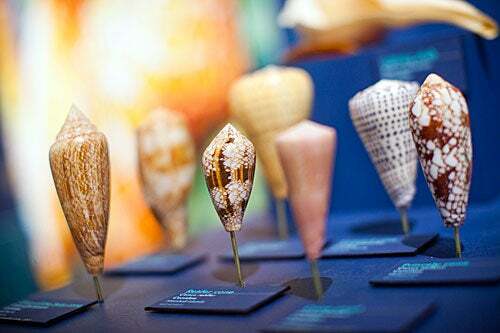 The Harvard Museum of Natural History is offering a molluskan feast — for the eyes, anyway — in the new exhibit “Mollusks: Shelled Masters of the Marine Realm,” which recently opened in the museum’s temporary exhibit hall. The exhibit, which will be on display for the next two years, presents a colorful depiction of the diversity of the mollusk branch of the tree of life, spanning everything from the giant clam — a 30-inch shell on display weighs 200 pounds — to the octopus. In between are the flat, orange, lion’s paw scallop; the tall, cylindrical, watering pot clam; an arthritic spider conch whose six splayed points extend from its shell; and a Venus comb murex, whose shell displays rows of long, comb-like, narrow spikes. 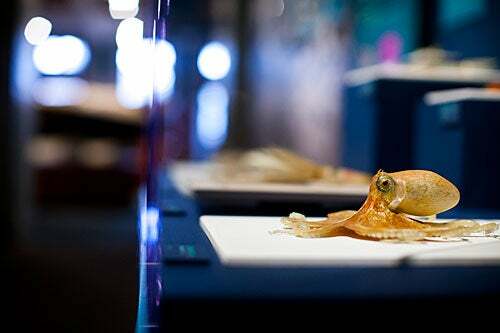 The exhibit also includes a case holding specimens from the museum’s glass sea creatures collection, which was created in the 1800s by Leopold and Rudolph Blaschka, the same artists who made Harvard’s famed glass flowers. 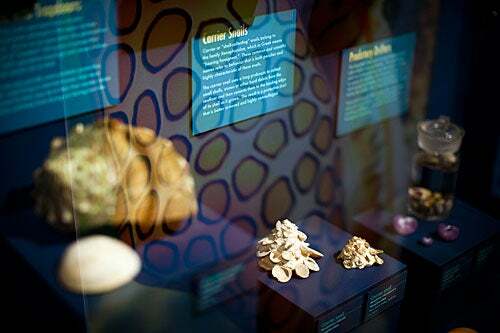 Beyond the specimens themselves, colorful exhibit panels explain the different types of mollusks, which also include snails and squids, provide a look at their commercial importance, and highlight ongoing Harvard research on them, which entails both genetic analysis and advanced imaging. 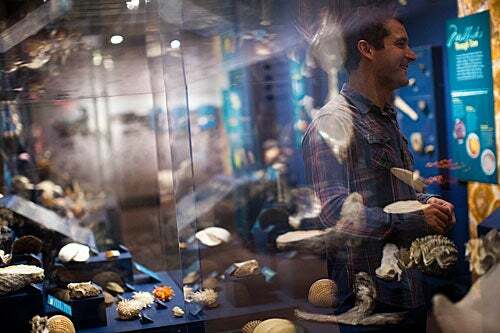 Gonzalo Giribet, professor of Organismic and Evolutionary Biology and curator of invertebrates in the Museum of Comparative Zoology, has collected mollusks and their shells around the world and is working to construct a mollusk family tree. 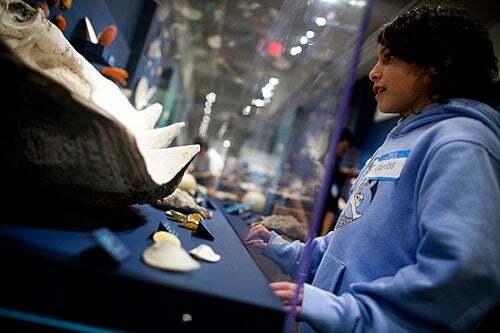 Giribet, who curated the exhibit, said mollusks are easier to study than soft-bodied invertebrates because even after a mollusk dies, it leaves a shell behind for examination. When asked his favorite specimen, Giribet points not to one of the flashy shells, but to a nondescript, limpet-like mollusk that grows just a millimeter across. These monoplacophorans, Giribet said, were thought to have become extinct millions of years ago until one was discovered alive in the 1950s. It has been one of Giribet’s goals to obtain one, which he did four years ago during a research dredging in 1,200 feet of water off San Diego. “I didn’t want to die without collecting one,” Giribet said. Curatorial associate Adam Baldinger, who helped select specimens for display, made a flashier choice. His favorite is a carrier snail whose shell is several inches high, and onto which it sticks other shells, providing camouflage as well as an unusual display. 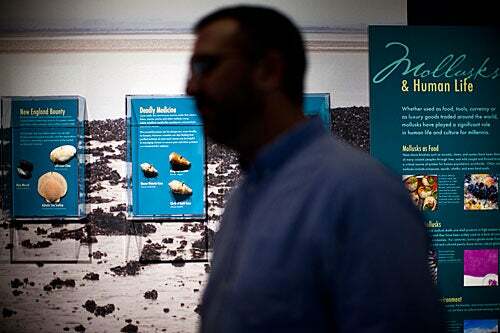 If there’s one message Giribet hopes visitors take from the exhibit, it’s that mollusks are extremely diverse, with snails, the most populous branch, having an estimated 70,000 to 120,000 species, followed by clams and other bivalves, at 20,000. Mollusks range from the deep ocean to fresh water to land. And, should some visitors become inspired to find out more about this broad-ranging part of earth’s biosphere, there’s still lots of research to be done. “We know there are many species undiscovered,” Giribet said. 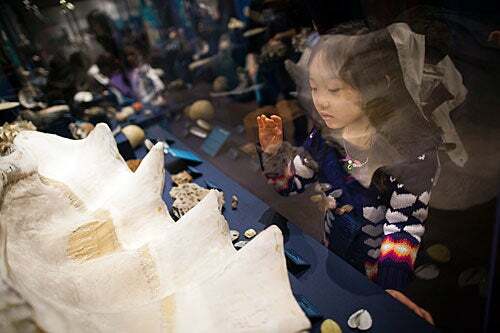 Olivia Lee (pictured) from Cambridge's Martin Luther King Jr. School admires the giant clam on display in "Mollusks: Shelled Masters of the Marine Realm." A variety of coned shells on display. Recognize any from past vacations? In a lecture at the Harvard Museum of Natural History, Professor Gonzalo Giribet discussed how scientists are decoding the Mollusca genetic family tree to learn how they’ve adapted, survived, and thrived since the pre-Cambrian era. The wonder of the octopus. Behold! Carlos Alvarado (pictured) from the Kelly School in Chelsea admires some of the exhibit's great wonders. Carrier snails, or Xenophoridae (which means "bearing foreigners" in Greek), on display in the Harvard Museum of Natural History. Curatorial Associate and Collection Manager Adam Baldinger speaks about the new exhibit "Mollusks" at the Harvard Museum of Natural History. “Often misdiagnosed, Cushing’s is associated with a broad range of health problems – causing physical changes, metabolic abnormalities, and emotional difficulties – and if not controlled, significantly increases patients’ risk of dying much younger than expected,” says Harvard Professor of Medicine Beverly M.K. Biller.